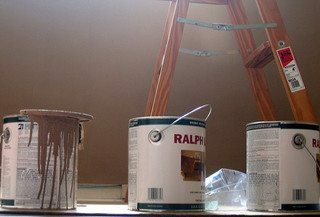 Alkyd vs. Laytex Paint ~ What’s the Difference? If you’ve ever stood in the paint store, staring in bewilderment at the myriad of cans, you’re not alone! Many homeowners can handle the task of painting their homes themselves, but when it comes time to select the right paint for the job, it can be a stumbling block. Hopefully, this information will shed some light on it! Residential paints are manufactured in two formulas; laytex (water base) and alkyd (oil base), and the one you purchase will depend on the location and durability needs of your area. Laytex ~ Laytex is typically used for walls and ceilings in areas that do not encounter moisture, as well as the exterior of homes. Though laytex is commonly used in bathrooms, you will get better durability with an alkyd paint, and the steamy shower streaks will wipe off easier. Laytex can also be used on trim areas (doors, baseboards, window casings, etc. ), but be sure to use a paint with some gloss (i.e. semi-gloss). Paints with a higher level of gloss are also more durable (see last week’s blog about Choosing a Paint Sheen). Because it’s a water-based paint, laytex dries fairly quickly between coats, and clean-up of your equipment is easily done with warm water. Alkyd ~ This formula is more durable than a laytex paint, so before you choose your paint, consider the amount of wear and tear an area might get. Kitchen and bath cabinetry are best served with an alkyd paint because of the heavy handling they endure. The trim areas in your home can also be painted with alkyd for the same reason. One of my favorite features of alkyd paints is that they produce a richer, more lustrous affect, so these areas I’ve mentioned really show well and look more professional with alkyds. My favorite painting contractor even recommends it for the trim on home exteriors too! The drying time is longer, however, so allow for that in planning your project. But, for this reason, alkyd paint allows you more time to work with it (i.e. smoothing out your brush strokes). Laytex paints start to dry faster, and can be less forgiving when you’re trying to perfect your technique. Clean-up is still fairly easy, though it requires mineral spirits or paint thinner. Check back often for more design and decorating tips. Remember that great design doesn’t have to be expensive; it’s how you put it together!